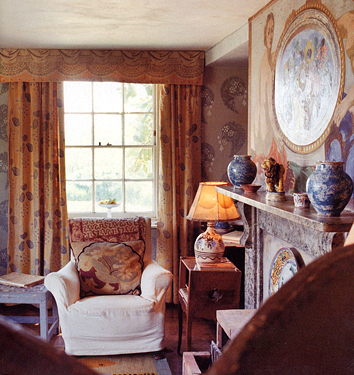 My favorite feature by far in the November Domino is on the Bloomsbury Group. Kate Bolick, Domino Features editor, was so inspired by the Charleston Farmhouse where they gathered that she reinvents her bedroom. I was so excited to find more pics online, I wish Domino would have included them in the magazine. I think the 8 page tartan spread, though lovely, could have been cut down to 4 to make room. She chose Temperley for the editorial which was perfect. Shots from the original house. How gorgeous is the wallpaper? 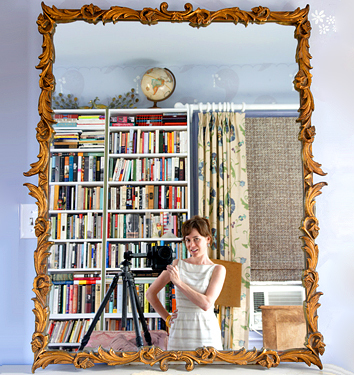 Kate has so many great pieces in her apartment, both before and after photos. They replicated the wallpaper with stencil and paint, such a great idea. 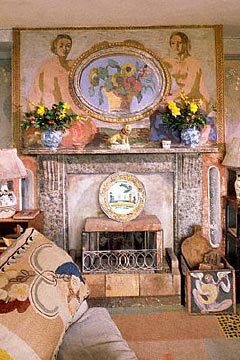 She was worried about her flea market finds clashing, but with the right pattern and color you can easily layer in a room. Cameron Silver forecasted a move to this aesthetic some time ago on style.com. I once followed this man around the Santa Monica Vintage Clothing Expo, he does have great taste.